The Japan Air Self-Defense Force (JASDF) scrambled fighter jets to intercept a Sukhoi Su-24 nuclear-capable strike attack aircraft on December 19, according to the Japan’s Ministry of Defense (MoD). 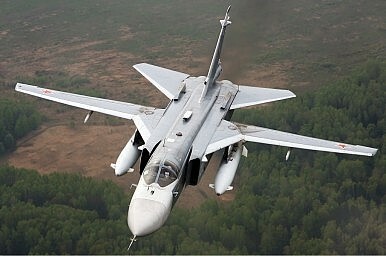 The Su-24 conducted its aerial patrol over international waters in the Sea of Japan; Japanese airspace was reportedly not violated. The December 19 Russian intercept marked the first following a five-week hiatus. The last intercept of a Russian military plane by the JASDF took place last month when an Ilyushin Il-38 “Dolphin,” a maritime patrol and anti-submarine warfare aircraft, was intercepted by Japanese fighters over the Sea of Japan on November 8. A previous intercept of two Russian Ilyushin Il-20 maritime reconnaissance and anti-submarine warfare planes took place on October 19. According to the Japanese MoD, the JASDF dispatched interceptor aircraft 904 times in response to unidentified aircraft approaching Japanese airspace during the last fiscal year that ended in March. Out of the total of 904, 500 scrambles occurred in response to Chinese military aircraft and 390 were prompted by Russian military planes. This marks a decline of 41 percent for Chinese military aircraft, but a 29 percent increase of intercepts of Russian planes. The JASDF usually dispatches Mitsubishi F-15J all-weather air superiority fighters, 215 of which — including the upgraded F-15DJ/F-15J Kai variants — are currently operationally deployed with the service. The JASDF’s other workhorse for interceptor missions is the F-2 multirole fighter jet, a Mitsubishi license-produced variant of Lockheed Martin’s F-16, of which there are currently around 90 officially in service. In 2016, the JASDF doubled the number of fighter jets dispatched for each intercept of foreign military aircraft approaching Japanese airspace from two to four. Additionally, the JASDF uses F-4EJ/RF-4 Phantom II fighter aircraft to conduct scrambles. Older F-15 variants and the remaining F-4s will be gradually replaced by the U.S. F-35A fifth-generation fighter aircraft. As I pointed out earlier this week, using the F-35A for scrambling missions will significantly drive up the costs of flight hours.